The high-seas adventures of two sisters and a homosexual stuffed Bear. the cuddlier side of genocide. can i pleaseeeee get a knitler doll for christmas? how come we didn't know about this?! we need to get involved. maybe we can send that weird little blue bear of yours around the world. i was unaware about the mutant animal trend that's occurring, as i was too busy tending to the mutant flies buzzing about my office. which had me in such a tizzy that i went off to the vending machine with a ten pence, believing it was a quarter. what i'm doing with a ten pence, i don't know, but i'm disturbed that it kept me from a package of m&m's. did you have any idea of the mutants that have been discovered this week? first, the monkey pig and now this! i'm feeling very ghostbusters over here. you are just lucky i didn't stab you. don't ever punch me in the nose after 1am ever, ever, again. please don't allow me to have any cotton candy tonight. ps. if you subtract sushi from the list this may be the exact menu of a 9 year old boy at sleep away camp. which one of you thought it was smart to make lemonade in the watering can? i know we only have one pitcher in the apt, but i've just fed the precious squash plant with countrytime. please be more diligent or we will never get any squash flowers this year. when you are finished playing with the bat that has moved into our garden, can you please pick some basil for this recipe? i would like to make it soon. will you be my sous chef? the spicy tuna roll i got for lunch tastes like bbq sauce. if i do not make it to the charity carnival tonight blame my lunch. I have an idea for blogging that might get us more into it and updating more often..
You know how we email each other a gazillion times day?? Let's just blog them instead. No more emails, just reading our own blog to see links to saved by the bell memoirs and updates on cervixes. last monday, after a particularly disturbing/distressful/crazy afternoon i commented to missy that it was the apocalypse. and although the world didn't end, nor was our entire week entirely doom-filled, something pretty apocalyptic did occur: we went to a movie theater. twice. so being the cineplex neophyte that i am, i was pretty clueless when it came to how things go these days at the concession stand. we pump our own butter?? i can order snack combinations? there are pretzel bites?! missy's boyfriend had the pleasure of explaining it all to me while on line - i imagine we resembled a gender-reversed mork & mindy episode - although i tuned him out once i discovered that the calorie count was listed next to each snack item. now, i understand that there are some sort of laws being passed about this and i've seen it already in some fast food chains, but come on! going to the movies is supposed to be some form of escapism - why the hell would i want to know that there are 3 billion** calories in my large soda? isn't it already pretty obvious that you're eating something fattening when the bucket of popcorn you're holding is bigger than a toddler? who didn't realize that the amount of calories you can consume in a movie theater is your weekly allotment of them? sheesh. way to take the fun out of everything, health dept. *since we know how much you all love guessing games, we'll leave it up you to guess which two we saw. hints: the first was the WORST MOVIE WE'VE EVER SEEN. EVER! AND WE THINK ALL THE GIRLS WHO TOLD US HOW GREAT IT WAS ARE TOTALLY NUTS. AND WE'RE SO GLAD WE ALREADY BOYCOTT THE REPEATS OF THE SERIES AS WE WILL NOW NEVER AGAIN WATCH ANYTHING THAT HAS TO DO WITH IT. the second, falling on the opposite end of our approval scale from the aforementioned big screen travesty, was that little film that just opened this weekend about a man in a bat costume. maybe you've heard of it? **figures may not be accurate. so we're back from vacation, but have been completely non-functioning the entire week thus far. complete wastes of space. it took us 3 days to wash a tupperware. one of us can't even handle painting her toenails. (i imagine a week of doing nothing more than walking 50 ft. from a house to the beach and lifting nothing heavier than a big red cup filled with booze can do that to a person). 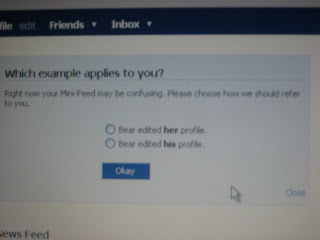 has anyone else experienced these facebook gender issues, or are they only discriminating against bears? When our mother was pregnant chrissy requested a dog or a brother. She got missy. The rest is history. because one infrequently updated blog isn't enough. bacon is my crack, and she is my dealer. our favourite brand of malarkey. so much better than malcolm. oddness + foliage = right up our alley. better gossip than the stuff missy makes up in her head. snark from our comrades across the pond.sign up. we don't know why. but he is. there's never an excuse for a badly decorated apt. the hound is new and improved. stuff for the grown-up child.